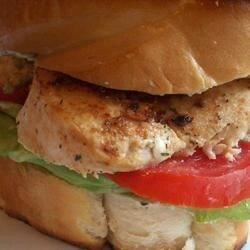 "Pan-fried chicken breasts with a fresh cream cheese dill spread and tomatoes and lettuce on toasty French bread, YUMMY! Oh so good with a glass of wine or lemonade! You can also grill your chicken breasts for extra flavor." This is a favorite in my household - I strongly recommend it! Extremly yummy, A little messy!